Framed art sentiment Down Home Collection$&174; wood frame in shaded finish with metal embellishment. 7" x 9" with glass; easel and hanger attached. 50th Anniversary Blessing - On your golden anniversary, may the Lord bless you with many fond remembrances of your meaningful moments together. May we continue to bless you with joy in one another. Jude 1:2 Warm wood tones with hinge and lock trim. 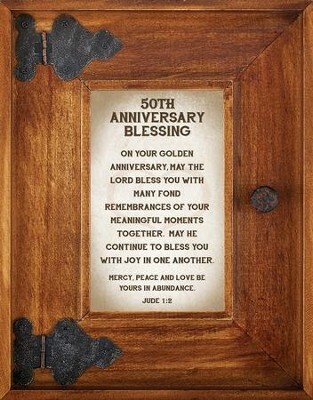 I'm the author/artist and I want to review 50th Anniversary Blessing Framed Art.